A multi-objective optimization approach is o.en followed by an a posteriori decision-making process, during which the most appropriate solution of the Pareto set is selected by a professional in the .eld. Conventional visualization methods do not correct for Pareto fronts with irregularly-spaced solutions. 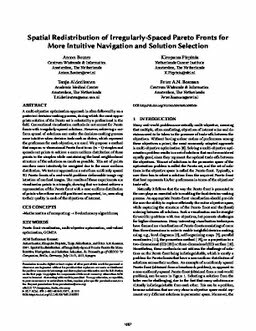 However, achieving a uniform spread of solutions can make the decision-making process more intuitive when decision tools such as sliders, which represent the preference for each objective, are used. We propose a method that maps anm-dimensional Pareto front to an (m-1)-simplex and spreads out points to achieve a more uniform distribution of these points in the simplex while maintaining the local neighborhood structure of the solutions as much as possible. .is set of points can then more intuitively be navigated due to the more uniform distribution. We test our approach on a set of non-uniformly spaced 3D Pareto fronts of a real-world problem: deformable image registration of medical images. The results of these experiments are visualized as points in a triangle, showing that we indeed achieve a representation of the Pareto front with a near-uniform distribution of points where these are still positioned as expected, i.e., according to their quality in each of the objectives of interest.